Opting for a bicycle instead of a car provides a wealth of benefits – from reducing carbon footprints, to health and fitness. However, sharing the road with larger vehicles isn’t always the advantage we think it is. With less protection from the elements, it’s no shock that bicycles are much more dangerous than your average car. In fact, the damages caused in a bicycle accident are frequently extensive, with life-altering physical, mental, and emotional consequences. At Cogburn Law Offices, our Las Vegas accident attorneys help victims obtain the compensation they need to recover from injuries sustained. How do I prove negligence in a Nevada bike accident? What damages can I collect in a bicycle accident claim? When should I contact a Las Vegas bicycle accident lawyer? What are the most common causes of Nevada bicycle accidents? What are the most common injuries sustained in a bike accident? How do I Prove Driver Negligence in Bicycle Accident Cases? Cyclists have the right to the streets – but put their lives at risk when sharing a roadway with a negligent driver. When drivers fail in their legal duty to obey traffic laws or drive with a reasonable standard of care, they can be held responsible for damages they cause during accidents. If you have been injured by a motor vehicle driver, you need to seek a consultation from an experienced personal injury attorney and win back the compensation you deserve for your injuries. Nevada rules compensation based on percentage of fault. If your percentage of fault in the accident is less than that of the driver of the motor vehicle, you are entitled to compensation for your injuries and loses. It’s only when your percentage of fault is more than the driver of the vehicle that Nevada law states that you’re not entitled to compensation. In the state of Nevada, you have up to two years to file a lawsuit according to the statute of limitations in a personal injury claim. This means you have two years from the date you were hit and injured on your bicycle to settle your case or file suit. If you do not settle within the allotted period, you will lose the ability to file or gain any compensation for your damages. What Type of Damages Can I Collect in Bicycle Accident Cases? If you or a loved one has suffered catastrophic injuries, retaining legal representation is an urgent matter. The Las Vegas personal injury attorneys from Cogburn Law Offices strives to get you the compensation you deserve. We will thoroughly investigate the cause of the accident and determine who is at fault. As trial lawyers, we offer far more than many law firms; we do not avoid court but focus our legal actions on the strategy that will best protect the rights of the person – including filing a lawsuit in civil court. Bicyclists and motor vehicles are subjected to follow the same traffic rules and regulations while sharing the road. Bicyclists are expected to ride with the flow of traffic, make turns, and follow road signs as if they were a motor vehicle. Motor vehicles, however, must abide by some additional requirements and regulations to ensure bicyclist safety on the roadways according to Nevada Revised Statutes §484B.270. What are the Most Common Causes of Bicycle Accidents? Nevada laws are designed to protect bicyclist on the roadways, but unfortunately bicycle involved accidents are all too common. Despite a bicyclists best effort, some accidents are unavoidable and due to the negligence of another. The smaller size and lack of protection do not make bicycles the safest mode of transportation, especially on busy roads. Often the size makes bicyclists more difficult for other drivers to see. Though many bicycle accidents are not the fault of the cyclists, it does not mean that bicyclists never contribute to accidents they are involved in. If you were injured by a negligent driver on the roadway, or involved in a bike accident of any kind, consult our Las Vegas bicycle accident attorneys to better understand your options in building and filling a case. What are the Most Common Injuries in a Bicycle Accident? Head and brain injuries are the most serious of the injuries reported. While wearing a helmet is important, even the most high-tech, modern bicycle helmet may not provide enough protection against a head or brain injury. Other common injuries span from the fact that bikers are virtually unprotected while riding, making injuries easier to come by. In 2016, there were 840 pedal cyclists killed in motor vehicle accidents in the United States, an increase from 829 in 2015, according to the National Highway Traffic Safety Administration (NHTSA). Pedal cyclist deaths accounted for 2.2 percent of all fatal motor vehicle accidents. In Nevada specifically, the NHTSA reports that there is an average of 4 deaths a year due to bicycle accidents, making Nevada the 26th most deadly state in the United States for cyclist. With 80% of all bicycle related accidents happening in Clark County, cities like Las Vegas and Henderson remain the most dangerous in the state. 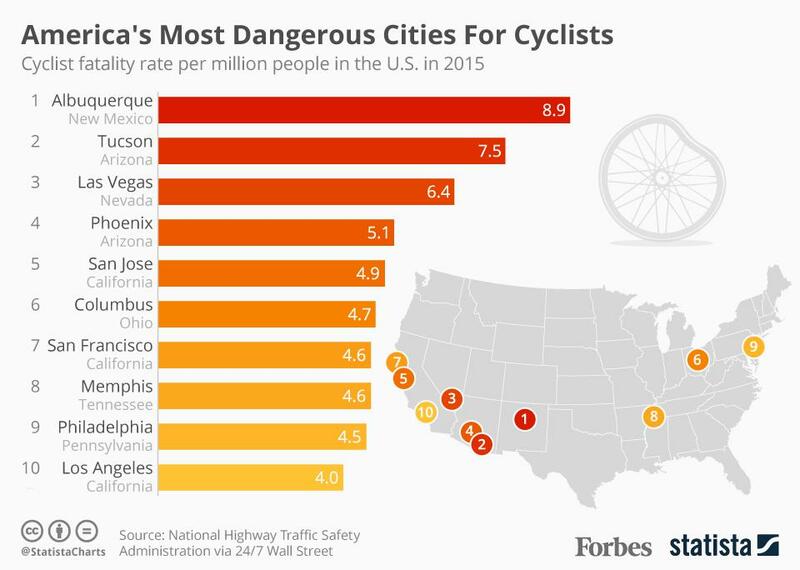 Forbes Magazine lists Las Vegas as the third most dangerous city for cyclists in America. Cyclist deaths have reached a record high with over 115 cyclists killed in 2017. The city’s infrastructure was established around motor vehicles, and while advances have been made, city streets are currently extremely dangerous for cyclists.